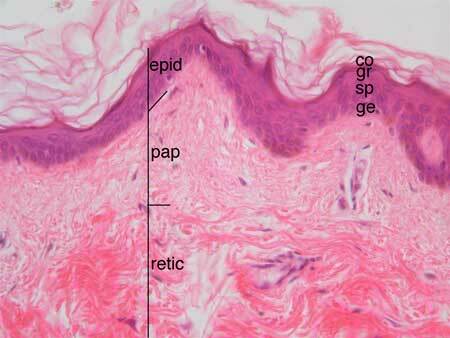 The skin consists of two layers, the epidermis and the dermis. Below the skin is a layer of areolar/adipose tissue called the hypodermis (or subcutaneous layer). The 400X image shows the epidermis and the outer part of the dermis. The dermis has two layers, a thinner outer layer called the papillary layer and a thicker deep layer called the reticular layer. The papillary layer has fine collagen fibers. 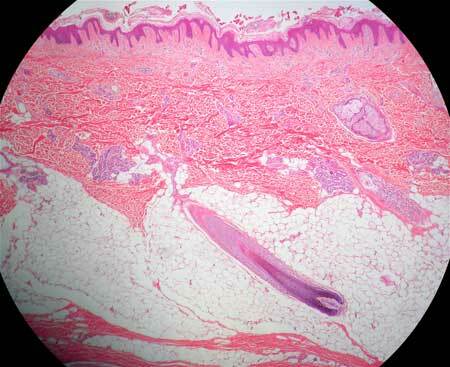 The reticular layer has much thicker bundles of collagen.